Pakistan has lifted its moratorium on the death penalty in all capital cases. It will begin executing criminals whose appeals have been exhausted, a spokesman said, reversing an earlier decision that only those convicted of terrorism would be executed. "It applies to all [on death row], irrespective of the nature of the crime," said the spokesman, who told Reuters that the order was made late Friday but not publicized. "The Interior Ministry has directed the provincial home departments to expedite the executions of all condemned prisoners whose mercy petitions have been rejected by the president," a senior Interior Ministry official told AFP. According to Amnesty International, there are currently over 8,000 people on death row in Pakistan. According to Legal aid group Justice Project Pakistan, it's the largest number of prisoners facing the death penalty in the world. The country had a de facto moratorium on executions in place from 2008 until December, when Taliban gunmen killed 134 children and 19 adults at a school in the turbulent northwest. Since the worst militant attack in the country's history, Pakistan has hanged 24 convicts. Death penalty advocates say it's the only way to curb militancy in Pakistan, a nuclear-armed nation of 180 million people. Following the deadly Peshawar school attack, Pakistan’s political leaders amended the constitution to form an alternative military court system that will try alleged terrorists and extremists. The amendments would see military courts established for a specific period of at least two years. Besides, the new legislative roadmap would focus on curbing the spread of terrorism by regulating seminaries, preventing hate speeches and provocative literature, and preventing terrorists’ propaganda on the media. Human rights groups argue that convictions are highly unreliable in the country whose criminal justice system is notorious. Justice Project Pakistan, which conducted research with Yale Law School, documented nearly 2,000 cases of torture in the eastern Pakistani district of Faisalabad. Interviewees accused police of manufacturing evidence and torturing suspects. Meanwhile terror cases are a challenge to prosecute, with extremists doing their best to intimidate witnesses for lawyers to drop charges. Many of those on death row were minors when they were arrested and say they were tortured into confessing, Justice Project Pakistan said, referring to the case of a man who was 14 years old when he was sentenced to death ten years ago. "We've seen time and time again that there is immeasurable injustice in Pakistan's criminal justice system, with a rampant culture of police torture, inadequate counsel and unfair trials," the executive director of Justice Project Pakistan, Sarah Belal, said in a statement. "Despite knowing this, the government has irresponsibly brought back capital punishment," she added. Pakistan death row cells, often measuring 8ft x 12ft (2.4 x 3.6 meters) sometimes hold up to nine or more prisoners in each small cell. 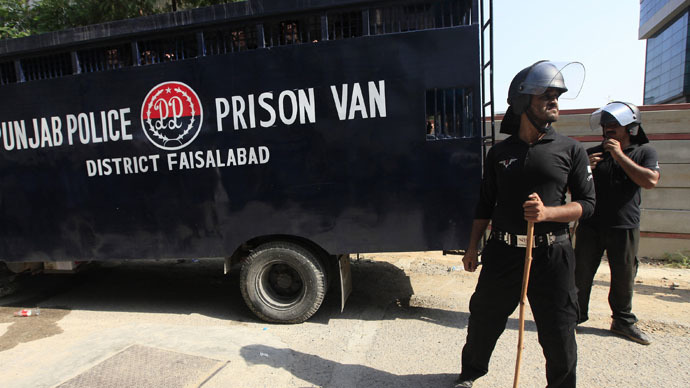 Prisoners are confined to these small cells for up to 23 hours per day, Justice Project Pakistan reports.